Can you count one blue whale? Probably. How about 16 lions? Or 44 penguins? Or 100 fairy flies? Join CBCA Award-winner Jennifer Cossins on an expedition through the animal kingdom, counting one to 100 and collecting fascinating animal facts along the way. Discover the colour of a zebra's skin under its stripes, how a tapir uses its nose as a snorkel when it swims, and that cranes are famous for their dancing! 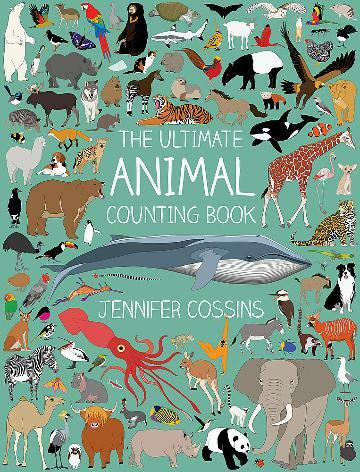 Beautifully illustrated with full-colour pictures of animals great and small, from all over the world - from the familiar wombat and sea turtle to the unusual gerenuk and caracal - THE ULTIMATE ANIMAL COUNTING BOOK is an utter delight. Jennifer Cossins is a 2017 CBCA Honour Book-winning Tasmanian artist and writer with a passion for nature, the animal kingdom and all things bright and colourful. A born and bred Tasmanian, Jennifer also designs homewares, textiles and stationery, which she stocks in her store in Hobart, Red Parka. Jennifer's books include A-Z OF ENDANGERED ANIMALS, 101 COLLECTIVE NOUNS, THE BABY ANIMAL BOOK and THE ULTIMATE ANIMAL COUNTING BOOK.